This summer, Bibiana is debuting a vegetarian tasting menu called ‘Il Gardino’, featuring local produce and changing items as the season progresses. The current menu sounds pretty tasty, and at $48 for four courses, the price is also right. The current menu offers an onion tart or Tuscan tomato soup to start, a whole roasted baby cauliflower (you’ve been eyeing these at the farmers’ market too, haven’t you?) or a roasted eggplant melanzane to follow, and a main course of either pasta with zucchini and squash blossoms or chanterelle risotto. Dessert keeps to the garden theme, focusing on fruit with a mixed berry salad with lychee sorbet or a cherry crumble with gelato. We’ve been looking for an excuse to go back after our less-than-perfect Restaurant Week experience last summer, and this might be it! On Saturday I continued working through our Restaurant Week top picks and had dinner at Bibiana. I’ll spill the beans now and say that unlike Willow and Tosca, which were fabulous, Bibiana fell flat. The foccacia was crusty and moist, and the funghi were cooked and seasoned just right to bring out all that satisfying mushroom texture and flavor. Had I known this was to be the highlight of my meal, I would have lingered a bit longer on each bite. For my entree I chose the ravioli filled with cacio cavallo cheese and served with marjoram, basil and tomato (also featured on the regular menu) over the other vegetarian choice of rigatoni with eggplant, tomato and ricotta salata (on RW menu only). The cheese was tangy and stretchy and the pasta fresh and firm, but I’ll just say it: the tomato sauce tasted like it came from a can. Labeled ‘tomato paste’. No amount of marjoram or basil could rescue it, or the dish. What a disappointment. 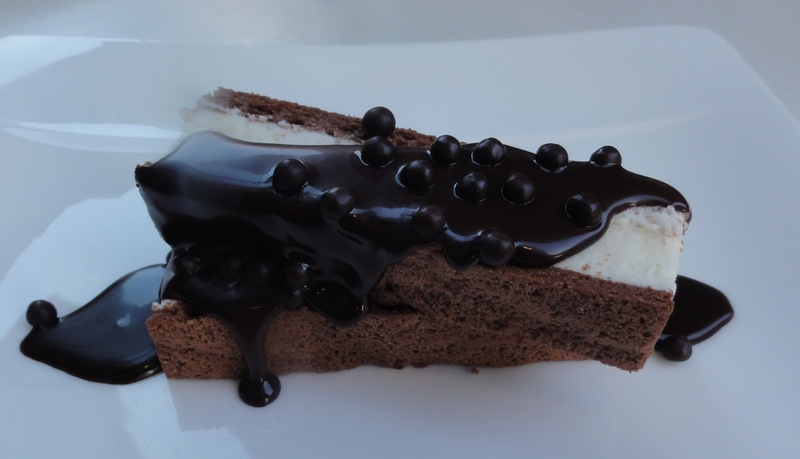 For dessert, our waiter recommended the gianduja, plum torta and peppermint semifreddo. I looooove anything with chocolate and hazelnut so I jumped on the gianduja, hoping to redeem the meal. Aaaand hope was in vain. Yes, this tasted pretty much just how it looked. 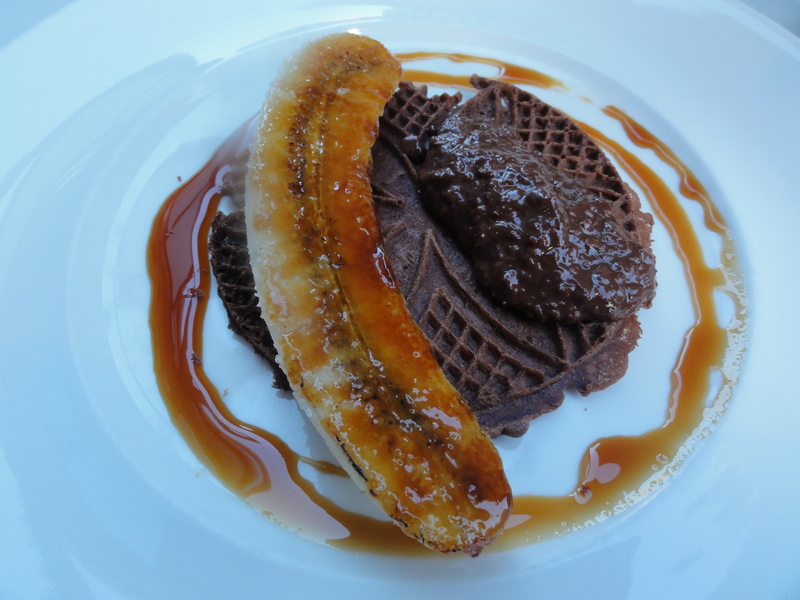 An entire half of a banana, caramelized, sitting next to a glop of gianduja over a chocolate pizzele. What? Am I supposed to spread the chocolate goo on the banana? Leave it as a lump on the pizzele? Fold the whole thing in half and chow down? I’m not saying I didn’t eat it, especially after leaving half of my pasta behind. I’m just saying that I expected more in terms of composition and presentation from Bibiana, not to mention sophistication. 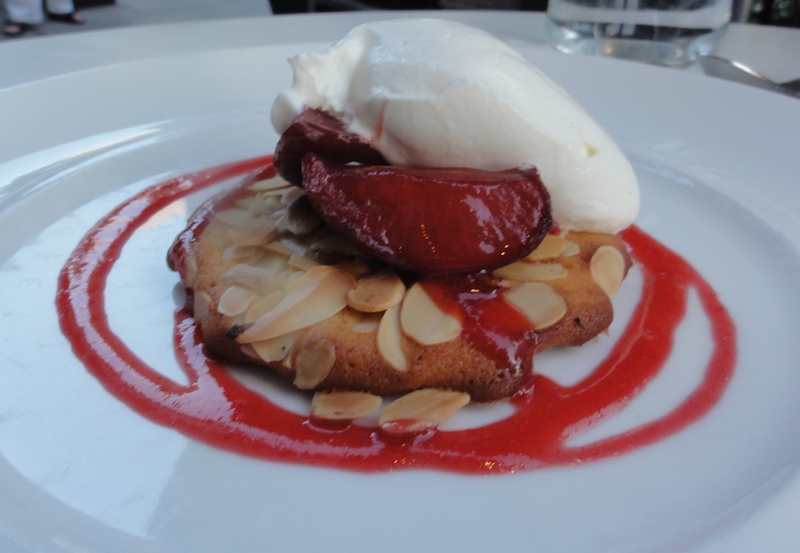 My two companions fared better with the peppermint semifreddo, which tasted like an ice cream sandwich version of an Andes mint, and the torta, a simple but successful combination of juicy plum on top of an almond cookie with chantilly cream. 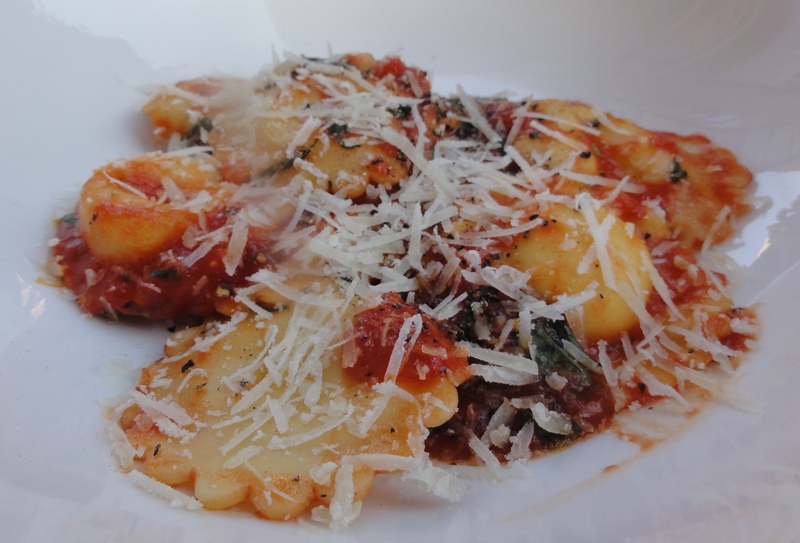 Although I liked the appetizer and two of the desserts well enough, I just couldn’t get past that ravioli. Did I experience the ‘dumbing down’ of the menu that supposedly occurs during Restaurant Week, despite ordering an entree available on the regular menu? You’ll have to let me know, because I won’t be going back to Bibiana any time soon to find out. 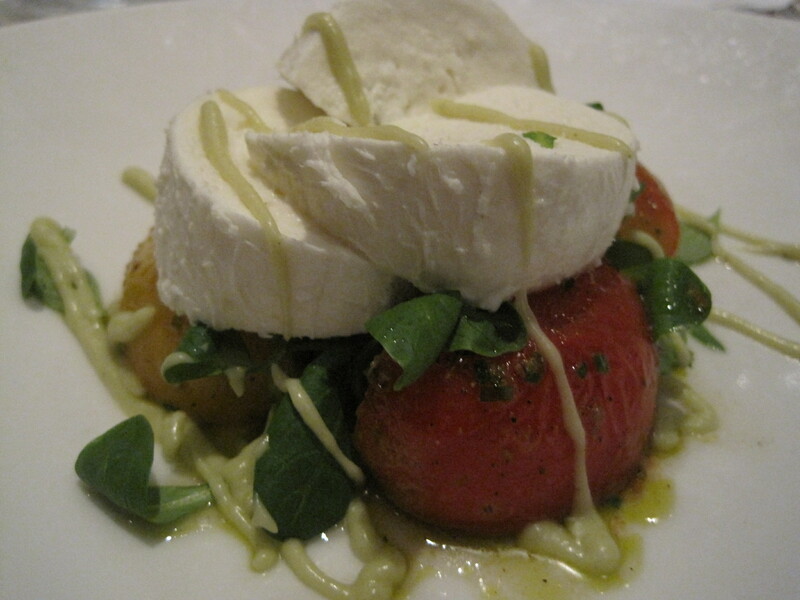 Our first Restaurant Week 2012 review is of Tosca, an upscale but not snobby Italian restaurant in Metro Center. It has long been my favorite for Restaurant Week, especially since they used to make their full regular menu available for it. 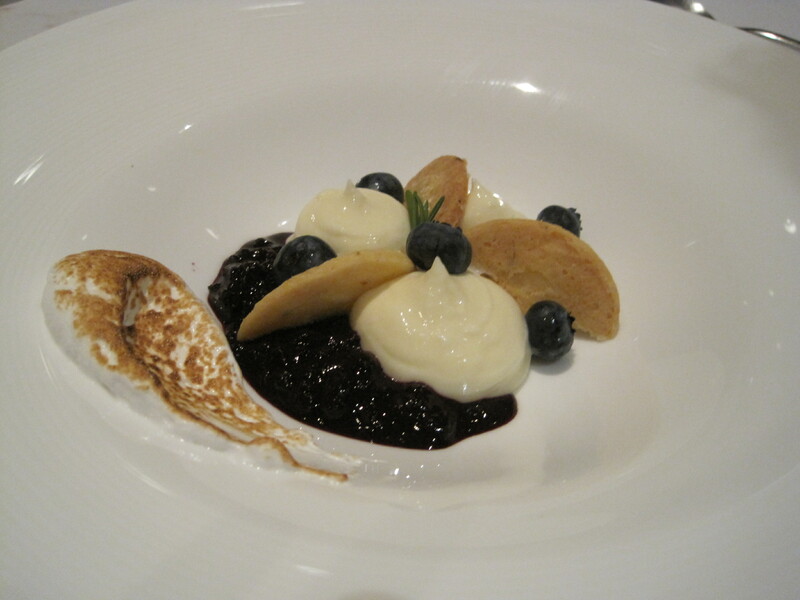 This year Tosca offered a modified menu for Restaurant Week, but the selection for vegetarians was still very nice. There is a lot to cover food-wise so we’ll get right to it. 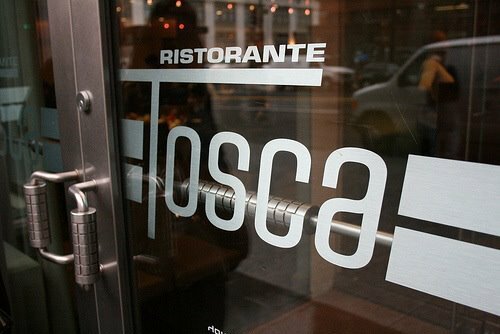 We’d contacted Tosca several days before our reservation to confirm that certain items were vegetarian. They very graciously responded that yes, the squash blossoms could be prepared without the anchovy puree and that the chef could make the risotto with vegetable stock for us. Our dining companions wondered if that was only because we’d let them know about this blog. Meera and I are pretty sure we don’t have that kind of clout. So contact Tosca ahead of time if you’d like to request such adjustments; their staff are very understanding and willing to help. 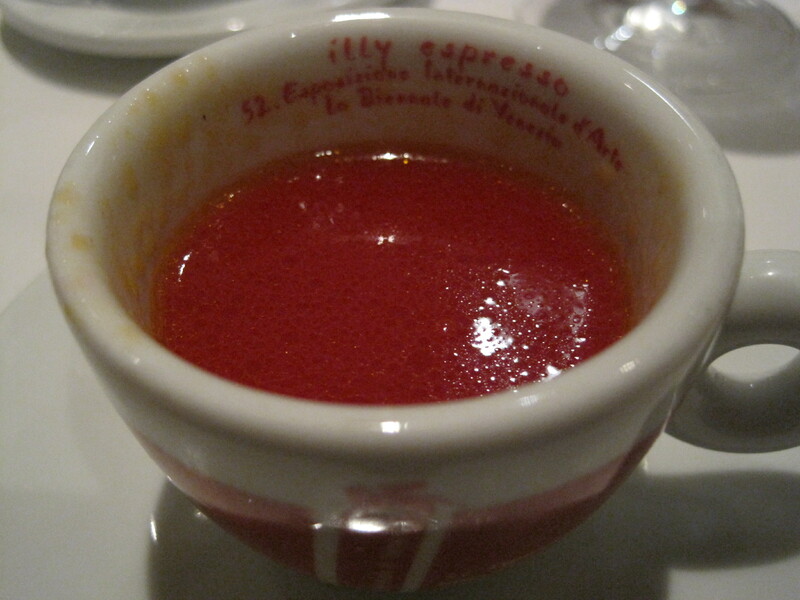 Without us even asking, our server brought each of us a refreshing little cup of watermelon soup to start. He noted that the usual starter was not vegetarian and they’d brought this especially for us. It was cool and slightly sweet with a savory undertone. Our table ordered all but the radicchio and pear salad (which we’ve had before and is good). The salad was serviceable and a good choice to avoid filling up at the beginning. The mozzarella was nice but the tomatoes, while tasty, seemed to have been refrigerated (such a crime, especially with flavorful summer tomatoes). 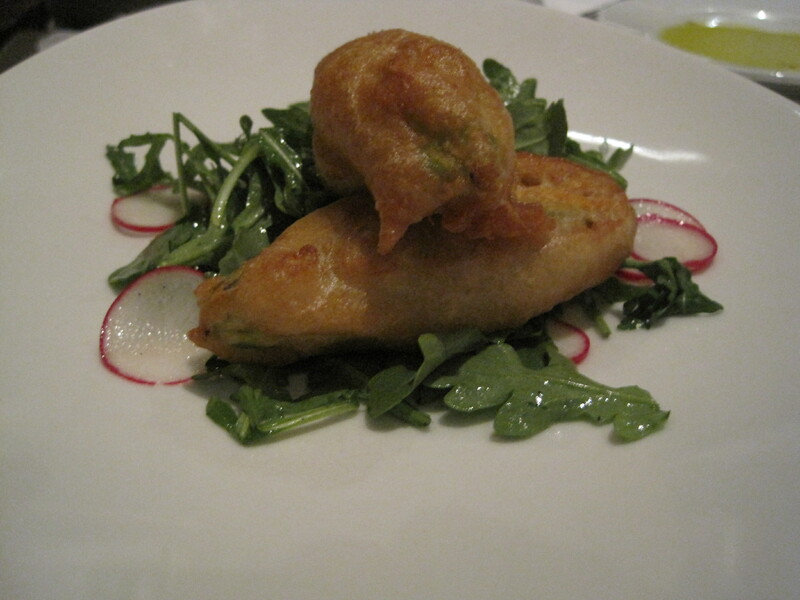 We’d been looking forward to the squash blossoms, but they were disappointingly bland and greasy. There was too much batter and they simply tasted like fried, instead of being delicate crispy vehicles for the cheese and herbs inside. Perhaps a bit of basil or sun-dried tomato pesto should have been substituted for the anchovy puree to add some flavor. We had the risotto and the tortelli. We did confirm that the spaghetti dish can be made vegan using dry pasta, allowing one to have a three course vegan meal at Tosca (with insalata mista and sorbet for dessert). They are also willing to create grilled vegetable plates and such, which is nice to know. 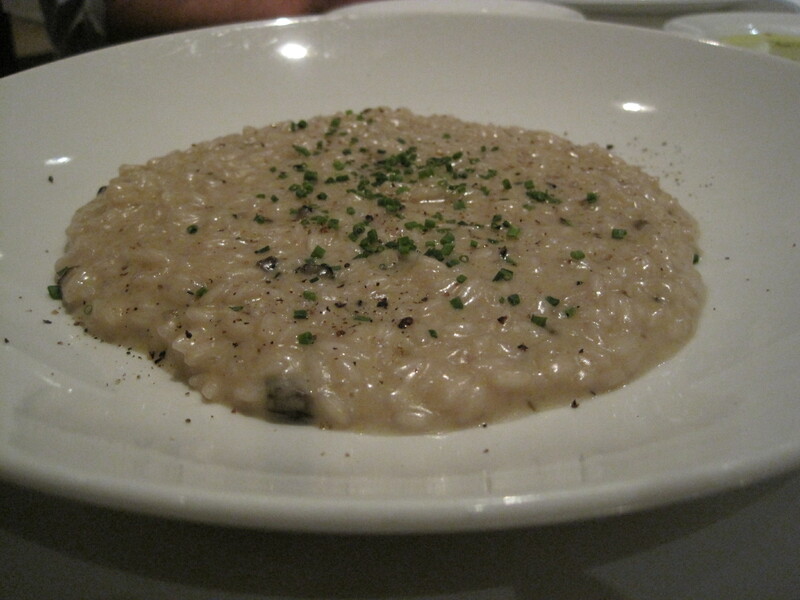 Risotto first: Wow. Best. Flavor. Ever. 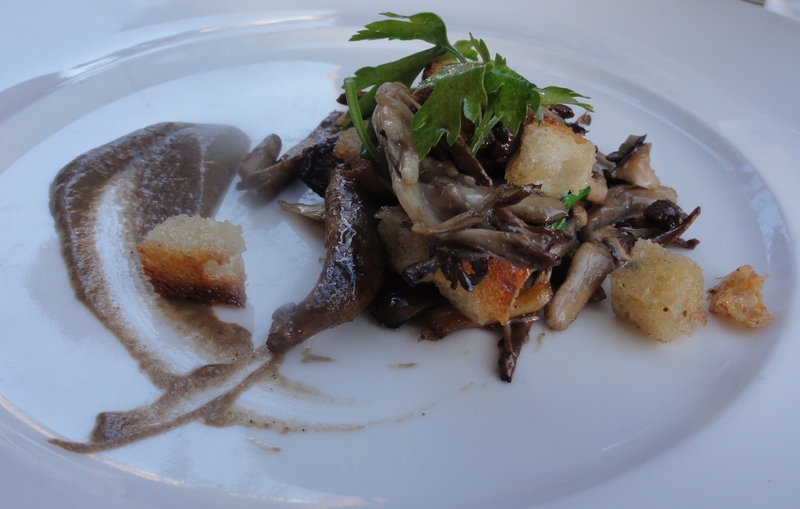 This dish was just bursting with umami richness, smoothly melding the flavors of the wine, cheese and black truffle. It needed a bit more more cooking, as the innermost bit of each grain of rice was crunchy-raw. And as a main dish it could have used a vegetable – maybe some spinach, asparagus or peas – for balance. Still, all was forgiven for that deep flavor. 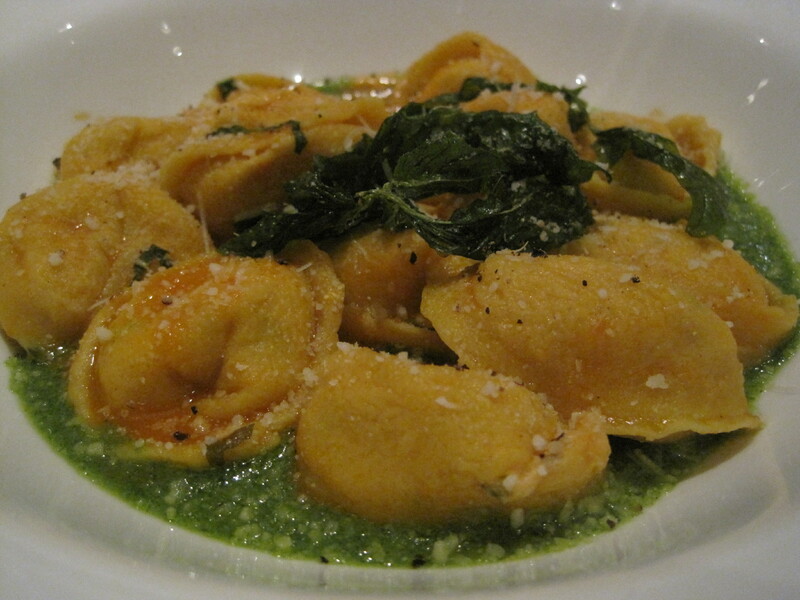 The tortelli was fantastic as well, al dente with a creamy ricotta filling and served with really excellent light pesto that let basil at peak season shine. We had the tiramisu, rosemary-cornmeal shortbread, and chocolate cake. 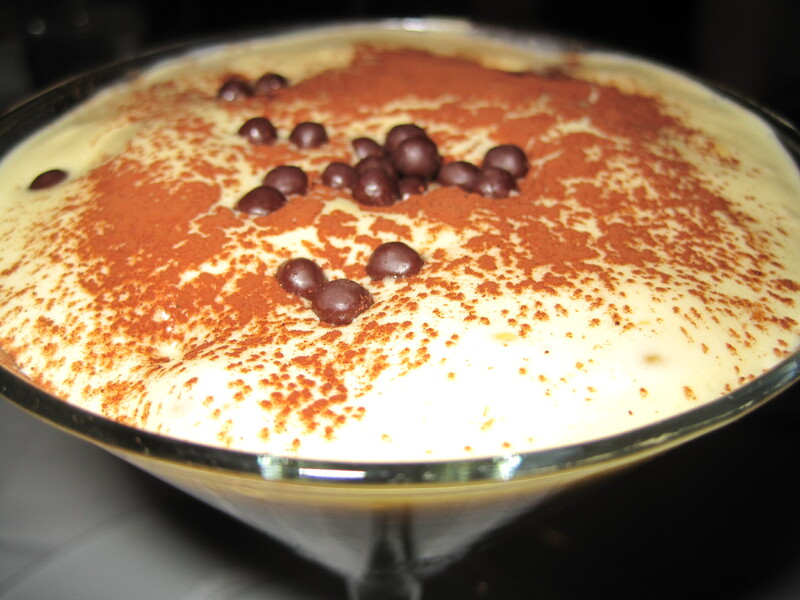 The layered tiramisu (served in a martini glass) was light and rich at once, and made you want to dip your spoon to the bottom to get a mouthful of mascarpone. The chocolate balls added a nice crunchy texture to the lovely, boozy mix. The lemon cremoso accompanying the rosemary shortbread was oddly too tart and eggy, so we wouldn’t recommend that one. 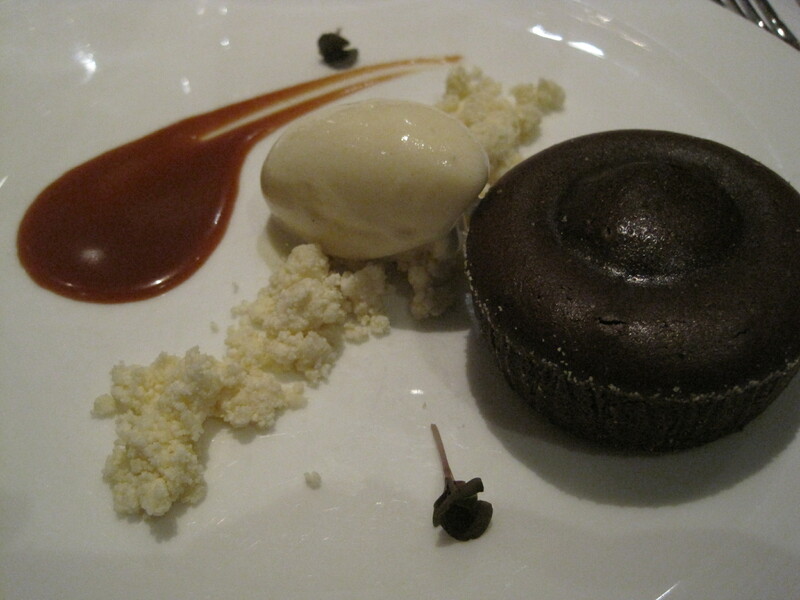 The chocolate cake was indulgent and paired well with the sumptuous passion fruit caramel. The only thing that could have improved it was more gelato, as the one small cannelle left us in a bit of a Got Milk? situation. Had I asked for more, the the kind staff would surely have brought it, but I decided to save my friends from having to roll me home. 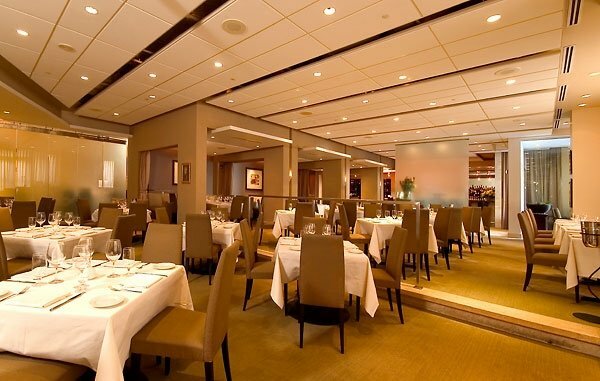 Go to Tosca for your next special occasion. The service is first-rate and your meal will be delicious.